It’s been like mourning the death of a friend, ever since my oven started sparking and then caught on fire. I guess it was a sign that I have been baking too much….seriously, I didn’t realize how much I cooked and baked, um yeah, I forgot…I am a Food Blogger. I know, I know, there are a lot of friends out there that really don’t care for cooking and baking, I get it, kind of, well not really, I am all about food. A great day for me consists of reading cookbooks, cooking magazines, cooking TV shows, Food Blogging, Facebook blogging on my food page, Twittering about food, saving recipes on Pinterest, deciding my meal plan for the week and Food shopping! Don’t forget cooking and baking in between all of this, only if I feel like it, not because I have to, because I want to. Plus I would be happy to go out for dinner every single night and still spend my day saving recipes. So this is the first dessert that I baked after my oven was repaired. Knock Your Socks Off Brownies! This recipe comes from The Pioneer Woman, Ree Drummond. I saw Ree make these brownies one late night on TV and have been dreaming about these chocolate caramel dream of a brownie ever since. Do you ever do that? See someone bake something and you just can’t get it out of your head. 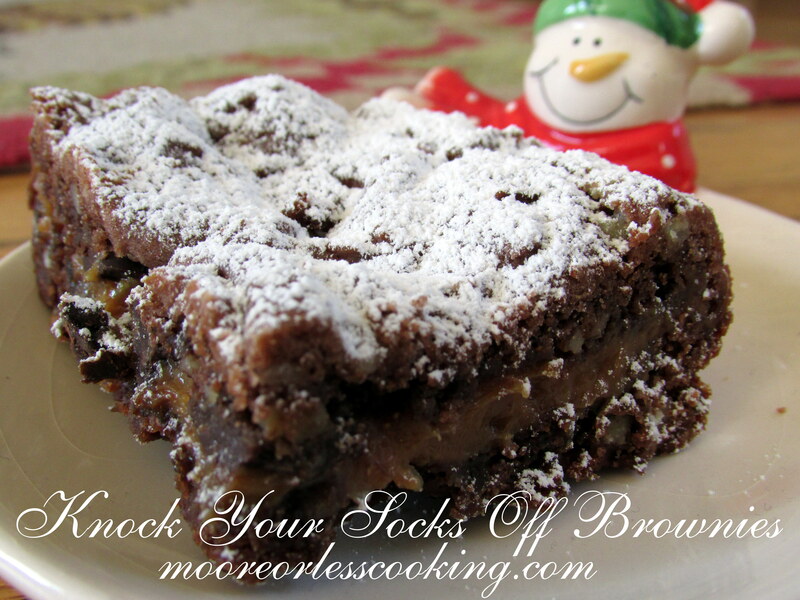 I do and these brownies are worth dreaming about! This recipe uses a mix, but it really is the best brownie ever with a caramel middle and delicious nuts! In a large bowl, mix together cake mix, chopped pecans, ⅓ cup evaporated milk, and melted butter. Stir together until totally combined. Press half the mixture into a well-greased 9 x 9 inch square baking pan. Remove pan from oven and set aside. In a double boiler (or a heatproof bowl set over a saucepan of boiling water) melt caramels with additional ½ cup evaporated milk. When melted and combined, pour over brownie base. Sprinkle chocolate chips as evenly as you can over the caramel. Turn out remaining brownie dough on work surface. Use your hands to press it into a large square a little smaller than the pan. Use a spatula to remove it from the surface, then set it on top of the caramel and chocolate chips. Remove from pan and allow to cool to room temperature, then cover and refrigerate for several hours. When ready to serve, generously sift powdered sugar over the surface of the brownies. Cut into either nine or twelve helpings, and carefully remove from the pan. These sound so good Netie! Hi Nettie! When I saw this brownies on my newsfeed, I just had to check it out! Surely looks delish! Hope you can find the time to visit manilaspoon.com. I have nominated you for the “Lovely Blog Award.” Thanks, Abby. wow this did knock my socks off just reading it! Thanks for sharing at Foodie Friends Friday! Wow Nettie! These sound crazy good! Can’t wait to try them – thanks for sharing!! Your blog looks great by the way! Thanks for hosting Lisa! So happy you like these yummy brownies! Just changing over my blog, it really is a work in progress! Always so happy to see you! Thanks for sharing Nettie! They look delicious! Thanks for sharing at Foodie Friends Friday! Please come back on Sunday to VOTE! Thank you Lois, I will be over to vote today! yes Debbie, with a double boiler. I used to. Vook and bake all the time, until my hralth amd living situation makes it very hard to do! My husband also loves to cook, but he can barely bake a frozen biscuit! But his pancakes are out of this world! Anyway I miss it and sewing! Love it!!! A Chunk of Chocolate Heaven! So glad your oven got fixed – it’s tricky with out it. We have a toaster oven for back up. (I actually had to correct that – I typed baked up first.) LOL These look and sound delicious. Thank you Linda, they really are! I have made over 12 dozen and they are always a huge hit!! Has anyone tried melting the caramels & evaporated milk in the microwave? If so, at what level of power and for how long?? Thank you. I love brownies! And have had quite the craving lately. Can’t beat a brownie called “knock your socks off”!!!! Must try! Wow, don’t those look good, my tummy is grumbling now! !